The government this year will build dozens of gas engine power plants (PLTMG) in the Papua and West Papua provinces. 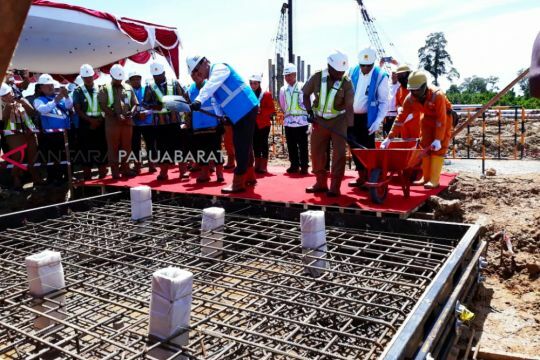 Maluku-Papua Construction Regional Executive Vice President Robert Aprianto Purbba during the premiere of the PLTMG construction in Manokwari, Tuesday, said that the total capacity of the MHP will be realized in the two provinces in 2019 is around 257.6 mega watts (MW). The construction of MHP in these two provinces includes, Manokwari-1 with a capacity of 20 MW, Manokwari-2 20 MW, Sorong-1 30 MW, Sorong-2 20 MW, Serui 10 MW, Nabire 2.6 MW, Timika-1 10 MW, Timika-2 30 MW, Biak-1 15 MW, Biak-2 10 MW, Sarmi 5 MW, Merauke-1 20 MW, Merauke-2 20 MW, and Jayapura 40 MW. He said, for 2020 the construction of MHP will be continued in Raja Ampat Regency, Bintuni Bay, Fakfak, Kaimana, Digoel and Jayapura. This year the construction costs have already been budgeted. He expects public support as well as the regional government so that the president’s joy in the Papua program is clear in 2020. PLN cannot work alone without the support of the community and local government. “Land constraints, but there are no problems. Said the governor and head of the National Land Agency, the dynamics, with a good approach the problem must be resolved,” he said again. West Papua Governor Dominggus Mandacan said on the occasion that electricity demand in West Papua continued to increase. On the other hand, the supply capacity of PLN is limited so there are still areas that have not received information. “And we are grateful that Mr. Joko Widodo gave serious attention to us in West Papua and Papua. Today we can do the first casting of the Manokwari MHP development with a capacity of 20 mega watts. We fully support the Bright Papua program in 2020,” said the governor. He invited the community to support the program by providing security and comfort in the development. Security is the key to the success of development in West Papua. “Like the Manokwari-1 PLTMG, the community must provide security so that as targeted, in July 2019 the construction is complete and can be operated,” said Mandacan.